Russian Civil War started in 1917 after the Bolsheviks seized power during the Russian October Revolution. At the moment Russian Empire was suffering internal contradictions and consequences of exhausting participation in World War 1. So when Russian Tzar Nicholas II was abducted the country split into two waging camps - Reds (Communists) and Whites (Monarchists). White was the color of the Russian Royal Family. The four-year war was bitter: it devastated the country economy and brought the young communist regime on the verge of destruction. Only fierce means like requisition of food from farmers and massive repressions allowed Bolsheviks to retain power. Right after the Revolution Bolsheviks started altering all aspects of life - abolishing everything bourgeous and putting forward things for working class. 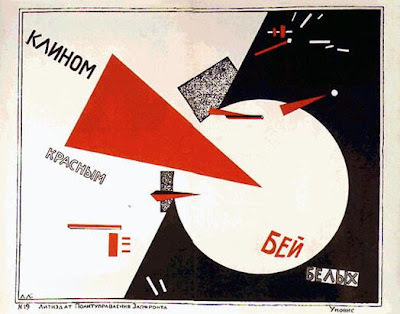 One of the popular trends was Russian avant garde - a movement, which complemented well with the radical communist ideology. The poster above is a masterpiece of the era. It was created by by El Lissitzky - one of the most notable artists, who took advantage of exploring the boundaries of art in that troubled time. Get the hard copy of this poster here!